The proposed sale of city-owned land for the construction of a luxury apartment tower appears to violate state and local laws that prioritize affordable housing. A rendering of the proposed development on East 12th Street. 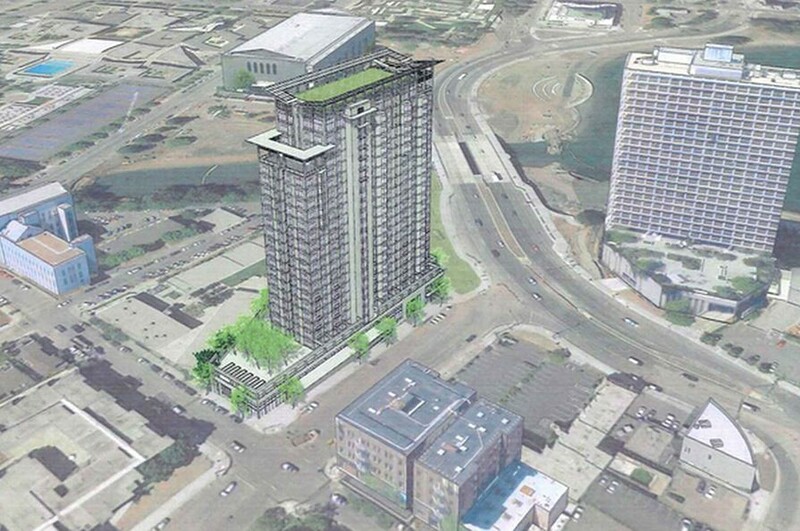 In spite of surging opposition from neighbors and affordable housing advocates, the developer who wants to build a controversial high-rise luxury apartment tower at the foot of East 12th Street near Lake Merritt is poised to win approval. But if the Oakland City Council votes to sell the city-owned land to developer UrbanCore LLC, it could violate both state and city laws. At the very least, say affordable housing advocates, the process has set a terrible precedent for future decisions regarding development on publicly owned land, and for achieving Oakland's affordable housing goals. At issue is the California Surplus Land Act and Oakland's own laws governing the sale of public property. According to state law, Oakland must prioritize the development of affordable housing for low- and moderate-income households on city-owned land. The Surplus Land Act, which was originally enacted in 1968 and has been updated several times since by the legislature, also spells out a number of requirements for the city, such as offering city-owned land to other public agencies first, before selling the land for another purpose — like the construction of a luxury apartment tower. Oakland's own law pertaining to city-owned land, passed originally in 1993 and updated two years ago, states that the city should comply fully with the state's Surplus Land Act. Furthermore, the city's law requires sales of public land to be conducted in an open public process that includes competitive bidding. None of this happened with respect to the East 12th Street parcel. "We raised the issue before both the planning commission and the council as to the Surplus Land Act and the city's own ordinance," said Mari Rose Taruc, a member of Eastlake United for Justice, a group that wants affordable housing built on the parcel. "Nobody addressed these questions." "This process that the city undertook was wrong in so many ways," said James Vann, co-founder of the Oakland Tenants Union. Vann is also a member of the Measure DD Coalition, an umbrella organization representing community groups with stakes in the $198 million Measure DD bond package that was used to fund public works projects around Lake Merritt. In the case of the East 12th Street parcel, Measure DD funded a street realignment that created the property. Beautification and infrastructure improvements funded by Measure DD also included a new park and automobile and pedestrian bridges over the channel connecting Lake Merritt to the estuary. Vann believes that the Oakland City Council violated the state Surplus Land Act and city law when it moved ahead in secret to solicit bids on the property from a pre-selected group of developers. "The city council, in its wisdom, approved an RFP process that wasn't open to the public," said Vann, referring to the private RFPs that were sent, without any public notice, to only three developers. Jeffrey Levin of East Bay Housing Organizations told the council's Community and Economic Development Committee last week that the city broke the law. "The RFP wasn't public," said Levin, and "apparently the decision to make it a private RFP was made in closed session with no public discussion. This violates the city's own property disposition ordinance." Oakland's property disposition ordinance does allow for the sale of public property without competitive public bidding, and for public land to be used for projects other than affordable housing, but the law states that in order to do this, the city council must make a finding or determination that these requirements are "impractical, unavailing, or impossible," or somehow not in the best interest of the city. This finding or determination must be passed as a resolution or ordinance by the council. "There were no findings in the resolution approving the ENA in July 2013. There are no findings in the ordinance that's before you today," Levin told members of the council's Community and Economic Development committee earlier this month, referring to the city's exclusive negotiating agreement (ENA) with Urban Core. Representatives of the Oakland City Attorney's Office did not respond to a request for comment, regarding the legality of the proposed land sale. In several reports to the planning commission, Redevelopment Program Manager Patrick Lane said the city rushed the private RFP process in order to approve a project before the state killed redevelopment in 2012. The project then continued on a fast and stealthy track until a few months ago. 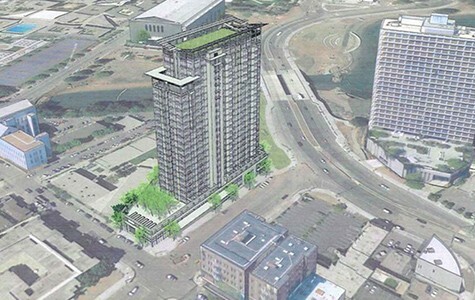 Levin worries that the city council and planning commission are setting a bad precedent that could harm Oakland's ability to build affordable housing. "There are a lot of other issues regarding public land coming down the pike. For example, the Coliseum City project, most of that is public land owned by the city, the county, or the port," Levin said in an interview. "They're all covered by the surplus lands statute. "We don't want screw ups on this project to become precedent for why they don't follow the law on future city-owned parcels," Levin continued.